Ireland's traditional music is nowadays so dominated by reels, jigs and, to a lesser degree, hornpipes that it's easy to forget that other forms of dance music once featured prominently in the repertoires of many musicians. The waltz (sometimes just simply called 'old time') still has some currency around the country and polkas are popular in Cork and Kerry. While highlands can still be heard in Donegal and Fermanagh, many other once fashionable dances (such as the varsovienne or mazurka) are rarely heard at a session, though some still figure in group set dancing. For a detailed history of all these dances, it's best to turn to Helen Brennan's estimable The Story of Irish Dance which describes how and when they entered the country and were adapted by the itinerant dancing masters (also neatly reminding us that some of these masters were actually women). Until the 1930s, when the Public Dance Halls Act began a wave of village hall building, people danced in their own houses (usually, the one with the largest kitchen), in barns or their haylofts or in the open air, often at a crossroads. Though the Act was intended to control the larger public dances, as Reg Hall remarks in his succinct notes to Round the House and Mind the Dresser, it did have some effect on the smaller soirées, especially in areas where the local Police took their supervisory duties too far or the priesthood remained active in opposing dancing. 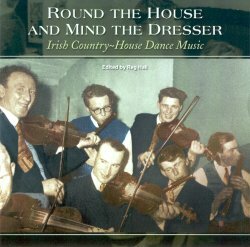 Country-house dancing did struggle on in a few parts of the country, but changing fashions in both leisure time and music, the impact of rationing in the Second World War and, finally, the rise of the céilí bands in the 1950s combined to end the practice. So Round the House recalls those years with a selection of remastered material spanning the period from 1925, when the Longford-born fiddler Frank Quinn recorded a fling in New York with guitarist Ed Geoghegan, to the summer of 1977 when Allen Feldman recorded John Doherty playing The 21 Highland for his Northern Fiddler project. On the way it draws quite heavily from Topic's own archives, though some of this material, such as the recordings of the Sliabh Luachra accordionist Johnny O'Leary and the London-born flute-player Billy Clifford, has not been available in the UK for some time. However, there are enough rarities and previously unissued recordings here to warrant this album's purchase. Most notable of the latter is a private 1963 recording of the fiddler Jimmy Power, naturally backed by Reg, his long-time accompanist on piano, playing the air The Little Fair Child as a waltz and investing it with an almost macabre sinisterness; a track whose listing is counterbalanced by a characteristic photo of Jimmy taking a drag on his cigarette between tunes. Reg later combined with Bill Leader to record the Irish-American accordionist Gene Kelly in 1968 playing The Cat in the Corner polka and, the following year, Michael Gorman playing a varsovienne, shortly before the Sligo fiddler's death. Rare 78s include Michael Coleman and his fellow fiddler Packie Dolan's 1927 duet on The Stack of Barley and Bantry Bay hornpipes, a recording which does not appear on Harry Bradshaw's double-CD Viva Voce compilation of Coleman's work, and a number of Irish-American bands, such as the Philadelphia-based Erin's Pride Orchestra and The Four Provinces Orchestra while the Flanagan Brothers represent their adopted home of New York. All told, there are twenty-eight tracks, featuring a feast of flings, a plenitude of polkas, a battery of barn dances, a set or two of slides, a host of hornpipes, a veritable varsovienne and not a lot of lancers (one, to be precise). However, to end on a cautionary note, the album's subtitle ('Irish Country-House Dance Music') is slightly misleading since it suggests implicitly that this is how these tunes might have sounded in situ. With the notable exception of the Johnny O'Leary recordings, live from Dan Connell's bar in Knocknagree, and the few 'home' recordings, these are largely commercial releases, restricted by the studio techniques and recording media of the day. So whether the musicians concerned would have played more rhythmically (the essential component of dance accompaniment), or employed less ornamentation, is open to question.